1. 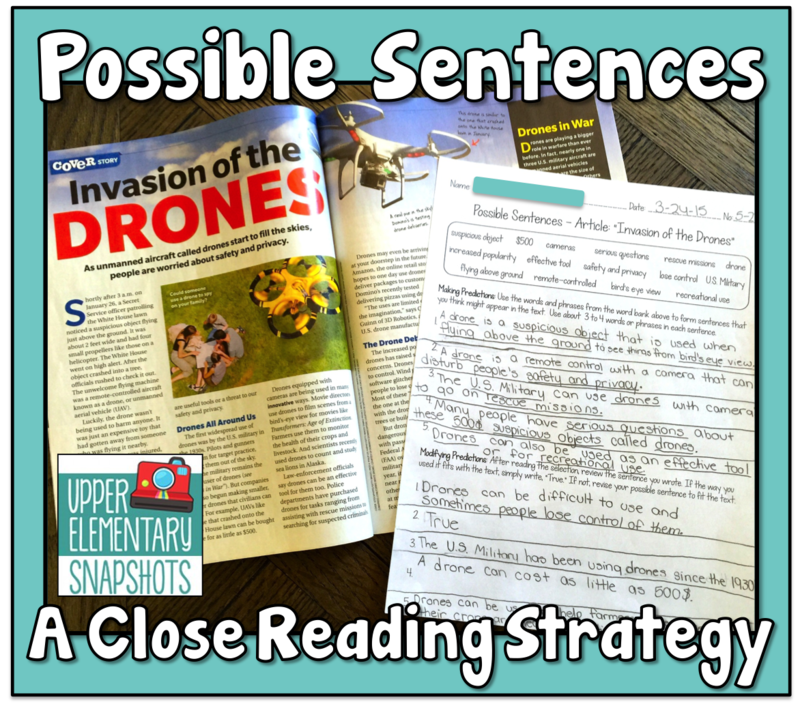 Before reading a selection with my class, I create a list of about 10 to 15 words and phrases that relate to some of the main ideas of the selection. I type them up and project them. They could also be written on the board. 2. 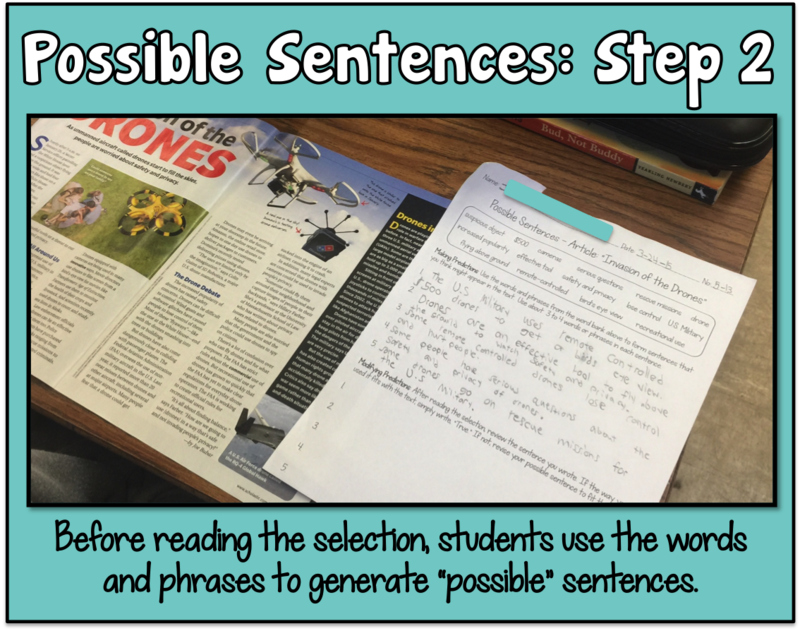 Next, I ask my students to use the words and phrases displayed to write 5 "possible sentences" about the article they are about to read. In other words, they have to piece together words and phrases to write 5 meaningful sentences that they "predict" might be in the selection. They come up with some great stuff!! 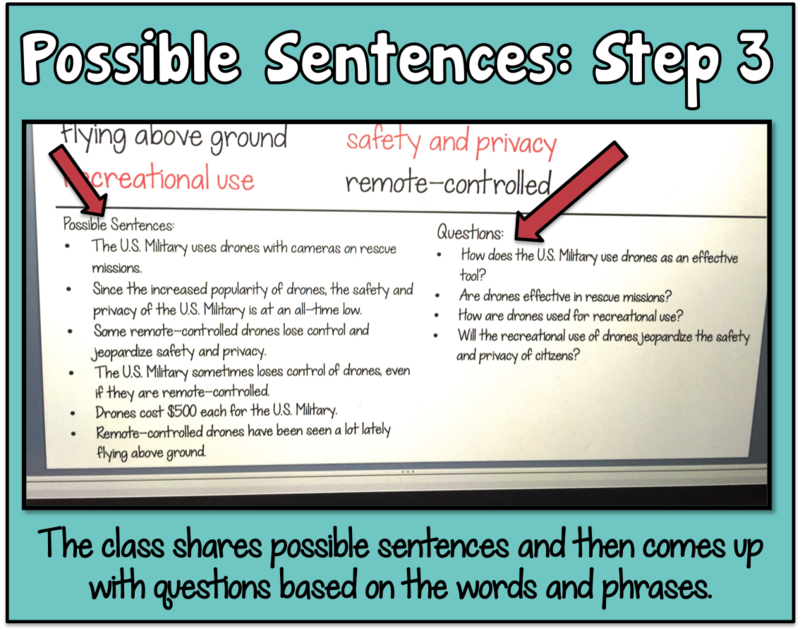 My students then share the sentences as a class and we record some of them to display. 3. 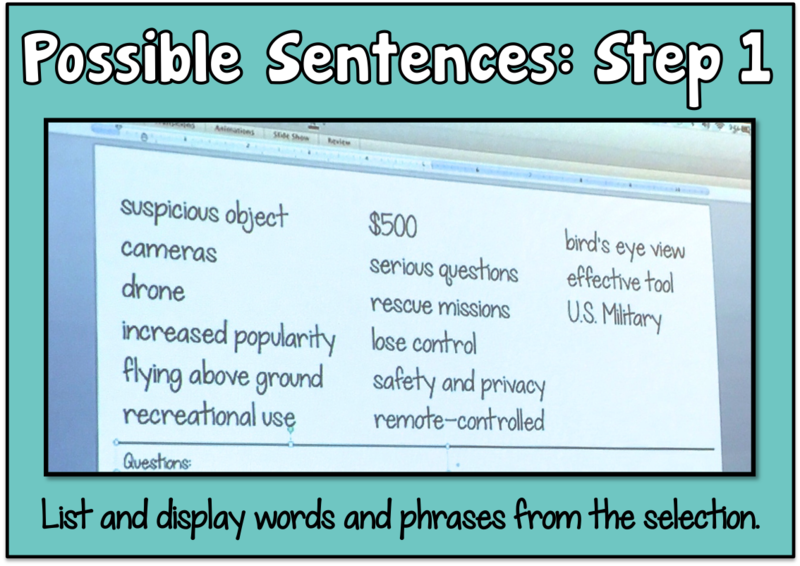 From there, we start to generate questions as a class to get everyone thinking about the words and phrases displayed. I highlight different words and phrases to focus their thinking. 4. FINALLY, they get to read the article! At this point, they can't wait to figure out what the selection is actually about, and they are dying to know if their sentences are correct. They are also eager to find answers to the questions we generated as a class!!! So much buy-in already, and they have barely laid eyes on the text. 5. As they read, students check to see if their possible sentences are correct. If they are, they simply mark them as "true". If they are incorrect, they modify them to make them true. 6. In the end, we use the phrases to discuss the main ideas and important details of the selection. Students share which of their sentences were true, and how they modified others to make them true. We also revisit our questions to see if they came up with any answers. 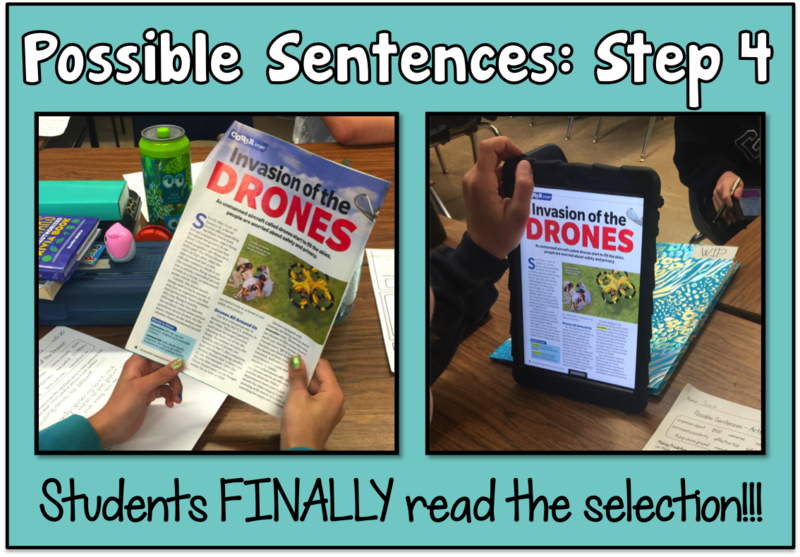 I love how this strategy builds up students' excitemenet and enthusiasm for reading an informational text. 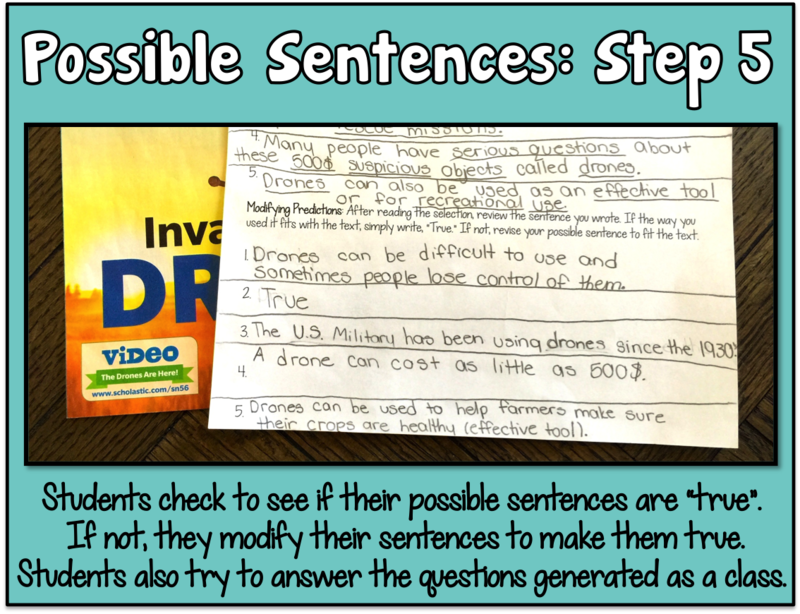 I also love how possible sentences force them to closely read, in order to determine the accuracy of their sentences, and to possibly answer the questions we generated as a class. I have found that Scholastic News is a great source for these types of selections. Each week before handing them out, I select an article or two, and write a list of words and phrases. My students look forward to using this strategy and we get to have so many wonderful conversations about the topics we read about. 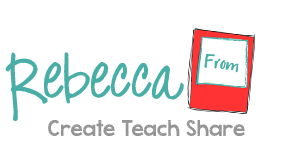 This is a strategy that is easy to prep, easy to implement, and one that offers amazing results for students!!! I hope you will give it try! !